It's still sunny and averaging around 20c in Cyprus, so as you can imagine I'm finding it quite difficult to get into the Christmas spirit. I love Christmas, it's one of my favourite times of the year; people seem to be more excitable, glitz and glamour appears in the shops for the party season and my favourite thing - friends and family come together. I normally put my Christmas decorations up mid-December, but I have to admit, I've already decorated my room with a few bits to make it feel a little more homely while I'm away. Hanging baubles are always an easy way to get things done, and I also purchased some Christmas lights from Jumbo - I'm absolutely loving them and they were so cheap! Still, if you're after some new decorations - or maybe looking for some festive gifts, these are some of the nicest ones I've come across this year. This is one of my favourite shops in Lincoln, selling all sorts of quirky cards, jewellery and things for the home. Honestly, I have to really restrain myself when I visit because I could easily spend hundreds of pounds in this shop - and that's just on the stationery. I love these pineapple decorations - pineapples seem to be really popular this year (pineapple Christmas tree anyone?) and you know I love a bit of sparkle, so the glitter on this is an added bonus. My second favourite shop in Lincoln! Amy & Steve at The Artisan Maker stock handmade items from Lincolnshire and further afield, so you know each piece is made with lots of love. I'm in love with many things from the shop at the moment, but as we're talking about Christmas decorations I'll stick with those for today. Starting with these awesome flying reindeer, which are made from wood and handmade. The pattern on them is suitably festive and they'd make a lovely gift if you could bear to give them away. Likewise, these Indian Scandi-style baubles which I might have to indulge in when I'm back and able to visit the shop. I'm always up for a bit of Scandi style, and I love this vivid, rich red and the cute little reindeer pattern. They'd look fab hanging in a doorway as much as they'd brighten up your Christmas tree. These ones cost £4 each. Have you seen Violet & Percy's Instagram account? It's the height of style, so it's no surprise they're nailing Christmas too. 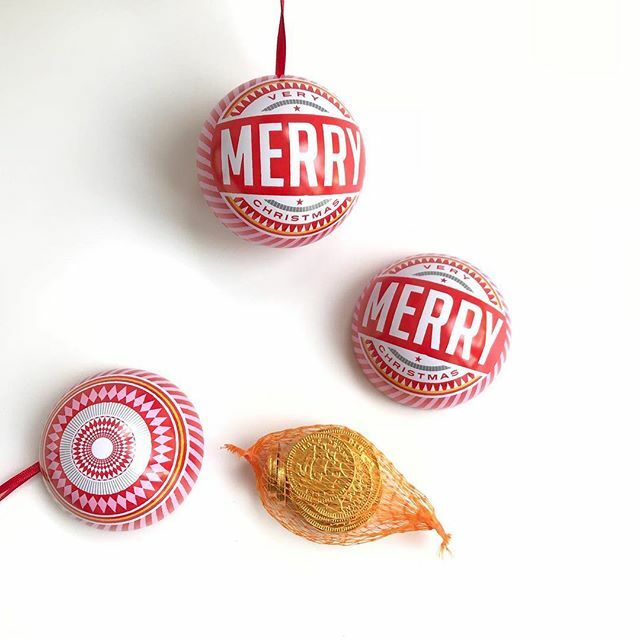 These baubles will definitely have you feeling joyful, because inside hides some Belgian chocolate coins. I love the vintage style, plus you can fill them with treats every year - bonus! (Hey, any excuse for more chocolate). They're priced at £6.50. I'm also loving this very simple snowflake decoration, which is just £2.50. This is the sort of thing I'd collect a handful of and then hang in a window at different lengths, or perhaps on a bit of dogwood to create a starker (and smaller!) Christmas feature. The kings of a quirky Christmas, you can find anything from robots to flamingos as part of the Ohh Deer decoration collection. I'm totally up for them, although as I tend to go for a more traditional red and gold colour scheme, this reindeer goes a little better in my house. I love its pom pom nose, and the almost child-like simplicity of the design. At £4.50 it won't break the bank either. While you're on the site, check out their fun advent calendar too. I'll be back in the UK in a few weeks and can't wait to get home and make the house all Christmassy. I'll post pics of my own decorations up soon!